Sir Alex Ferguson has whittled down the search for Edwin van der Sar’s replacement to a shortlist of three after deciding that Tomasz Kuszczak and Anders Lindegaard cannot be trusted to succeed the Dutchman at the end of the season. Van der Sar confirmed today that he will retire this summer and that has left Ferguson intent on bringing in another goalkeeper despite the £3.5m arrival of Lindegaard from the Norwegian club Aalesund. Ajax’s Maarten Stekelenburg, the Germany international Manuel Neuer and, to a lesser extent, Atlético Madrid’s David de Gea are among those under consideration and that, in turn, is likely to lead to Kuszczak’s departure, with the Pole having decided to seek a transfer if he continues to be seen in the role of understudy. A summer of change at Old Trafford will also see Gary Neville end his 17-year playing career. The defender is not even guaranteed to be in United’s 25-man squad for the Champions League knockout stages, to be submitted next Tuesday, now Ferguson has to find a space for Lindegaard. Plans are being made for Neville’s testimonial and Ferguson is contemplating finding a role for the former England international, 36 next month, behind the scenes. Ferguson is also planning to hold talks with Paul Scholes to ascertain whether he wishes to extend his career by another year – the 36-year-old is undecided about whether he should follow Ryan Giggs, a year his senior, by playing on – and then the priority will be to find a goalkeeper who can bring an assurance to the team that has not always been there since Peter Schmeichel left. Van der Sar informed Ferguson of his decision a month ago and the man who saved Nicolas Anelka’s penalty to win the 2008 Champions League final plans to have an extended break before deciding whether he wants to return to the sport in a coaching or managerial role. 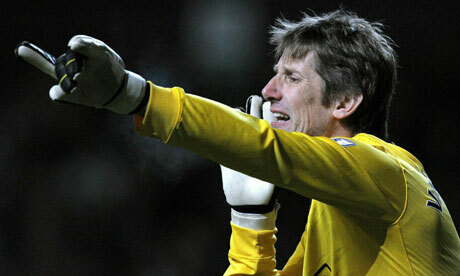 Van der Sar has been thinking more seriously about retirement since his wife, Annemarie, suffered a brain haemorrhage in December 2009. “It is now time to pay attention to my family,” he said. “Let’s just say that it was playing on my mind from the moment Annemarie had her stroke. She has fought back from it. We decided on another year in England and to stay at Manchester United. it took six years to replace schmeichel.. when the big dane left, i was hoping that van der Sar would come but the juve got to him first.. from the listed three, although Neuer seems the better option but i prefer Stekelenburg. so is gary neville retiring or moving to another club? whichever way i wish him the best. he made such great contribution to the club only that his pace were not as good as 10 years ago.. probably he could stay there developing those young talents in the academy.. to Giggsy and Scholesy – please go on playing.. article from Guardian. This entry was posted in spoRts.woRld. Bookmark the permalink.